Almost all of these recipes are easy on the budget and family-friendly, and most of them are excellent choices for any night of the week. Plan ahead and incorporate some of these meals into your weekly dinner list. 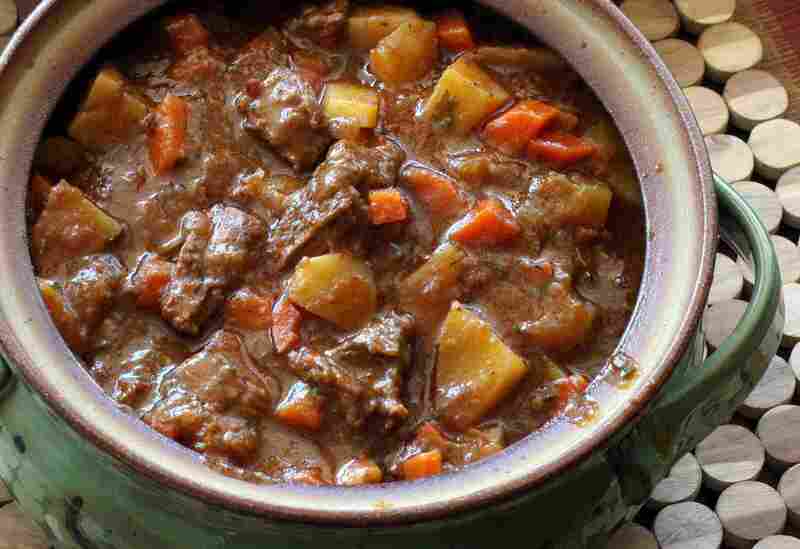 Guinness stout adds body to this hearty beef stew. Serve it with cheddar bacon scones or Irish soda bread. Use chicken breasts or boneless chicken thighs in this hearty chicken and pinto bean chili. This versatile Creole jambalaya can be made with chicken, ham, diced leftover pork, or turkey. Add some shrimp near the end of the cooking time, if you like. This dish is made with country-style pork ribs on the bone. A variety of chopped aromatic vegetables and apple cider add flavor to the wonderful broth. This basic meatloaf is comforting and delicious. Serve it with mashed potatoes and corn or green beans. The ketchup or tangy barbecue sauce topping is optional. These braised whole chicken legs are flavored with a combination of coconut milk and curry powder along with tomatoes and ginger. This rich and delicious cheeseburger soup is made with lean ground beef, potatoes, milk, and cheese. Top it off with some crumbled cooked bacon. Serve the soup with biscuits or crusty bread. These basic Southern pinto beans are cooked to perfection in the slow cooker with ham hocks and seasonings. These succulent lamb shanks are braised with aromatic vegetables and a tangy red wine sauce. This dish is always a hit! Serve cabbage rolls with mashed potatoes. Freeze your head of cabbage for several hours and the leaves will be ready to stuff - no boiling required! What could be better on a cold winter's day than coming home to a fully cooked meal? This pot roast was made for long, slow braising, and the slow cooker does the job beautifully. You can prepare the meat and vegetables in the crockery insert the night before and refrigerate overnight. It's the perfect busy day meal. Whole chicken legs or chicken leg quarters are flavorful and juicy, and they're budget-friendly. The chicken legs are rubbed with a mixture of garlic and seasonings and then they're roasted to perfection. This is another fantastic slow cooker meal. Pulled pork is always a family favorite, and preparation so easy. Use your favorite barbecue sauce to make sandwiches with the pulled pork. Serve with coleslaw and beans. This is a super easy stovetop chili made with ground beef and canned beans. Use a purchased chili seasoning mix or the homemade mix provided with the recipe. Use leftover chili to make chili biscuit cups! Make this dish fast or make it slow, and then enjoy a tasty Tex-Mex meal. We used a pressure cooker to make the filling, but the dish can be cooked in the crockpot as well. These homemade red beans are jazzed up with spicy andouille sausage. This is a traditional Cajun-style bean and rice dish. The spiced red cabbage makes an excellent side dish to go with these skillet pork chops. This warm, inviting soup is loaded with flavor. Use fried corn tortilla strips or tortilla chips as a garnish for this soup. This tomato-based clam chowder gets extra flavor from the bacon and clam juice. If you prefer a New England clam chowder, try this creamy slow cooker clam chowder. Garlic and rosemary flavor these slow-braised chicken legs, and a little tomato paste and white wine make a hearty, rustic broth. Use whole chicken legs in the recipe or make it with thighs and drumsticks. Shredded pulled pork in an hour and a half? Pulled pork normally takes hours to cook, but the pressure cooker shortens the cooking time significantly. These shoulder chops are braised to succulent perfection with red wine and herbs. Your family will ask for this meaty ziti bake again and again. It's the perfect dish for a snowy winter evening. Serve it with crusty garlic bread and a simple tossed salad. This is an all-in-one meal that's perfect for a weekend or holiday dinner. Use fingerling potatoes or chunks of red-skinned potatoes. This rustic potato and ham dish is an excellent choice for a family dinner. Add a tossed salad or steamed vegetables to make it a meal. This casserole is my take on the British Lancashire hotpot. We used spicy Louisiana Cajun sausage in this version. These classic stuffed peppers are a family favorite. The blanched bell pepper shells are filled with a mixture of ground beef, rice, and tomato sauce. The stuffed peppers are finished with a cheese topping. For those days you want to be meat-free, there's this soup. Use a "many-bean" soup mix and this recipe to make a satisfying lunch or dinner soup. Add crusty bread and you have a perfect meal. Add ham, sausage, chicken, or ground beef if you like. This meaty stew is made with chicken thighs and stewing beef, along with potatoes and carrots. The secret to the great flavor is a few tablespoons of steak sauce. This Brunswick stew is made with cooked pork shoulder or leftover pulled pork, along with shredded or chopped cooked chicken thighs and vegetables. The meal takes about 1-hour start-to-finish if you cook the chicken and pork in advance.